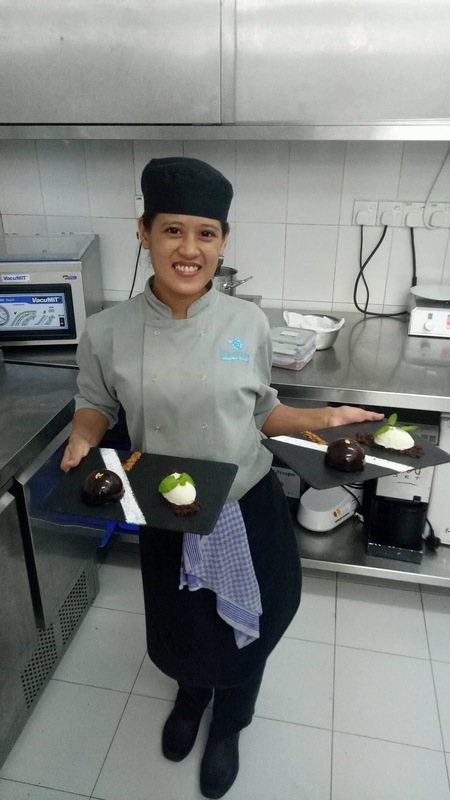 Anihan Technical School Graduate, Jarmaine, is a Commis Pastry Chef at the Duniye Restaurant, Maldives. Anihan graduate, Jarmaine Arambala, did her on-the-job-training (OJT) in Sta. Elena Golf and Country Club in Laguna. When Jarmaine or Jam started her OJT, renowned Singaporean Chef Joseph Goh was a bit doubtful if she could really do the tasks in the kitchen because she seemed too demure for that kind of work. Soon, Chef Joseph was happy with how Jam was proving herself, tackling and delivering whatever tasks were assigned to her. When she graduated from Anihan in 2013, Jam was immediately employed at Sta Elena. Now, she is working at the Duniye Restaurant in the Kuramathi Island Resort of the Maldives. Plated desserts prepared by Jam. Jarmaine is from Banlic, Cabuyao. Her father is a bus service shuttle driver while her mother is a full-time housewife. She is the fifth among seven siblings. She applied to study in Anihan because she realized she needed a scholarship in order to be able to finish her studies. Since after graduating from Anihan, Jarmaine has been helping her parents and her siblings in their financial needs.